are you ready for some more fonts? what’s your all-time favorite font? Love that cursive font. That would look adorable on a baby shower invitation. Thanks! I am way behind in learning this and I am new to this whole font thing, but really want to use it. Can you tell me what I do with the font after it has downloaded. I can't find it in my fonts in word, but it is in my font book. How do I know use them? I used it to make a preschool book for my little ones. I did pictures and words for each letter of the alphabet and slid them into plastic sheets so they could practice tracing the letters. The uses for this font are endless. Plus it's cute for school themed crafts! I really like cursive stamp! I love Pea Hannah Vanilla from Kevin and Amanda. I tried to change the font on my blog, but gave up after an hour and a half of following the most detailed instructions to no avail. I wish I was tech savvy because I would jazz my blog up a little, but alas, I was not blessed with that ability. 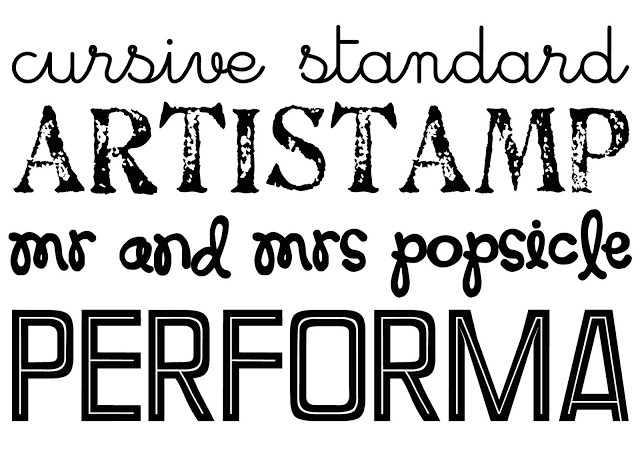 I am obsessed with fonts! I don't know if I could pick an all time favorite font, it kind of depends on what I need it for. There are so many that I love!!! Lately though, one of my favorites has been Tangerine, from fontspace. i really like pine lint form. I'm a little font crazy! 🙂 I just love them! Doodle Tipsy, Elephants in Cherry Trees, and Olduvai are favs. Thanks. I'll stop back later to snag these. My fav right now is 1942 report. I LOVVVE when you guys do the free font day. I'm all giddee about it! Thank you!! As for favorite font that ARTISAN font may not be it! Does anyone know how to get these fonts into blogger? I have them in word but I would love to be able to use them for blogging. I love it when you share fun fonts … thanks! One of my favorite fonts is Fat Free. Thanks! Is the Fab Fonts font all different fonts or is that one? I really like those. p.s. Are you going to be doing any mother's day crafts that kids can make? Thanks. Thanks for these! Love Fab Font day! My favorite at the moment is Pharmacy. I use it for everything!! BOSSHOLE by Kevin & Amanda-favorite font! I like smiley monster and wish i was taller from kevinandamanda.com. I also L.O.V.E. ckhandprint from http://www.lettersnstuff.com/fonts/fonts.htm. Letteringdelight.com has some cute clipart fonts. Thank you soooo very much ladies! I have been looking for the "smiley monster" font EVERYWHERE! You're thee best. From one font lover to another..Very cool! Love your choices and design!